As someone who briefly played drums in a college band, I can appreciate how helpful having a third arm would be when it comes to hammering out complicated solos. 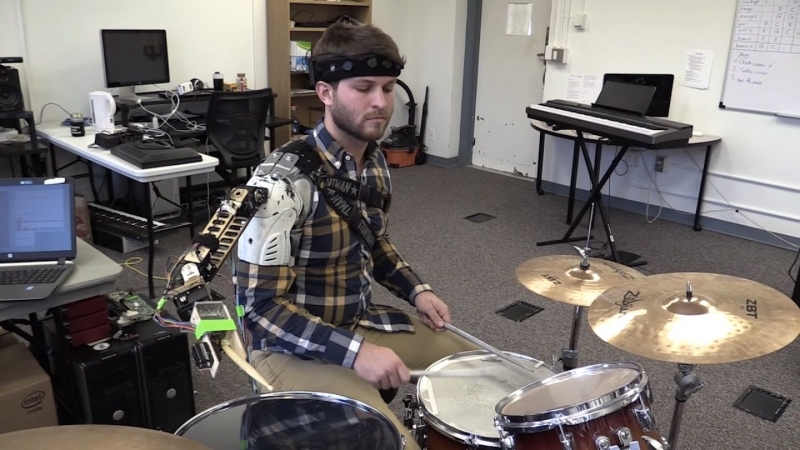 It seems that researchers at the Georgia Institute of Technology also thought that drummers could use a helping hand, and have developed a robotic limb to help boost their skills. The project, from the University’s Center for music technology, aims to push the limits of what humans can do with robotics. The “smart arm” can be strapped to a drummer’s shoulder, and responds to human gestures and the music it hears. When the drummer moves to play the high hat cymbal, for example, the robotic arm maneuvers to play the ride cymbal. If the drummer then switches to the snare, the mechanical arm shifts to the tom, and so on. What makes the arm especially smart is that it can it listen to the music being played in a room and improvise based on the beat and rhythm. It can slow down and speed up the tempo depending on what a musician plays. The robot limb uses built-in accelerometers to sense distance and proximity, so it won’t put a stick through a drum skin or get in the way of the drummer’s actual arm. To make the robotic arm move naturally, the researchers used motion-capture technology. The next step for the team is to link the arm with the drummer’s brain activity. The researchers are experimenting with an electroencephalogram (EEG) headband that detects brain patterns. It’s hoped that this will eventually allow the arm to react when a musician simply thinks about changing the tempo.